Publish quality blog content optimized to drive traffic and convert readers into customers, all with a full suite of integrated blogging tools. Start creating blog content that attracts visitors and converts readers into customers. See why thousands of customers use HubSpot to host their business blogs. Write, format, and edit blog content with ease. Write high-quality blog posts that help you get found in search, social media, and beyond. Draft blog posts from scratch, or start with one of our pre-made blog post blueprints. Quickly insert images, format headers, and add links with the on-page editor. You’ll rest easy knowing that every blog article is automatically optimized for mobile. Use the composer to streamline the editing process by adding comments, sharing feedback, and collaborating with authors. Preview how your post will look on any device, then publish content your visitors will want to read from beginning to end. Get sustainable traffic from search, and convert readers into leads. Create blog content that continues to generate traffic and conversions long after it was first published. Get as-you-type keyword suggestions and on-page SEO advice so you can outrank your competitors for the keywords that matter. Use with HubSpot’s content strategy tool to prioritize the blog topics that actually drive search traffic. Then, insert relevant, personalized calls-to-action to convert blog visitors into subscribers and leads. Promote your content and analyze its performance. Get your blog content in front of the right people at the right time. Use the calendar tool to plan your blog’s editorial calendar in advance, then schedule posts to publish at the best times. Connect your blog to your social media accounts and automatically share new content on top social networks. Customizable subscriber emails automatically notify readers when you publish new content so your dedicated readers never miss a post. 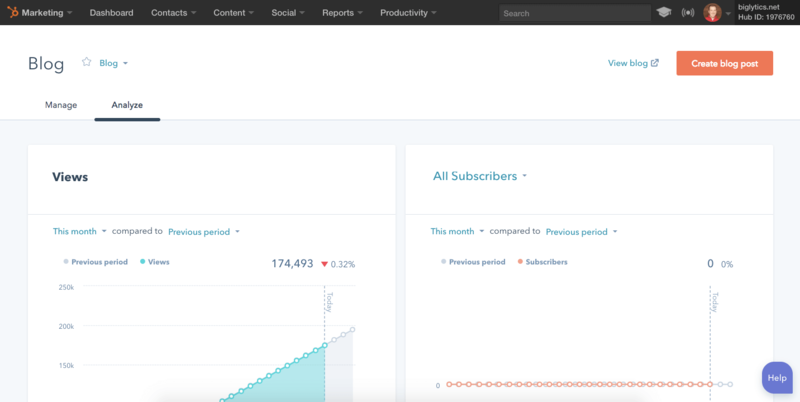 Then identify which blog posts are generating traffic, leads, and customers with HubSpot’s built-in analytics tools so you can create more of the content that drives results.